Night Watchman Heavy Duty Self-Defense Sword Cane | BUDK.com - Knives & Swords At The Lowest Prices! 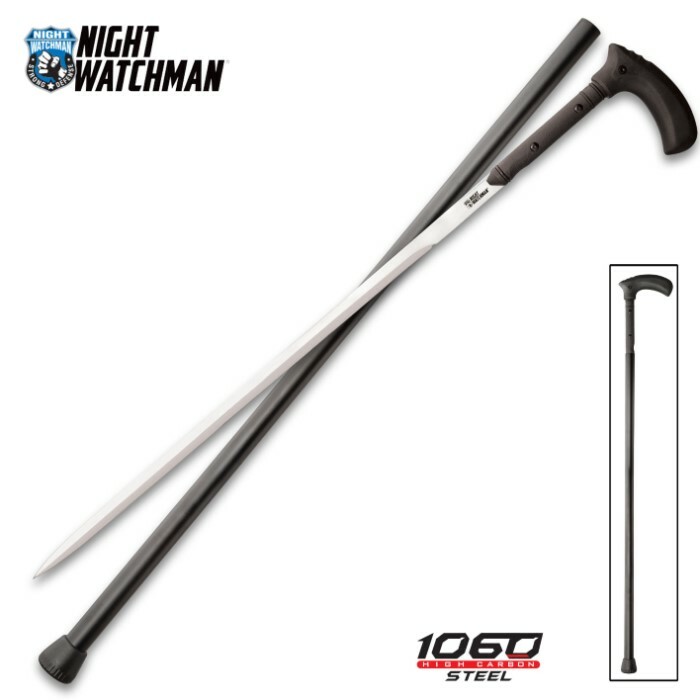 You can always count on the Night Watchman Heavy Duty Sword Cane, whether it's to assist you in walking or as an extra measure of self defense. This inconspicuous cane conceals a razor sharp 25" 1060 high carbon steel blade that is poised and ready to defend you at a moment's notice. The formidable blade is housed inside a black, hard-coated aluminum shaft that can even be used as a striking weapon during a surprise attack. The handle is molded from sturdy fiber filled nylon for a secure grip, and a rubber toe keeps the cane from slipping. If you're a sword collector, or just need some additional peace of mind, this is the sword cane for you!